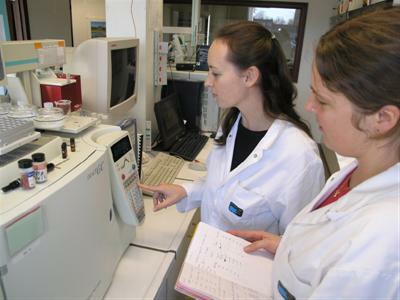 The ECOCHEM group (Ecosystems Physico-Chemistry) seeks to improve our knowledge of marine, freshwater and terrestrial ecosystems by carrying out analytical-chemical, physical and biochemical analyses, developing these analyses and validating the results. The results are part of our national contribution to international (environmental quality) monitoring commitments and provide a scientific basis for policy decisions and support the study of diverse ecosystems. In other words, our work is carried out for policy support and scientific research ends. We measure the following physicochemical parameters in water: salinity, dissolved oxygen, temperature, pH, total alkalinity, SPM (Suspended Particulate Matter), nitrate, nitrite, ammonium, phosphate, silicate, DOC (Dissolved Organic Carbon). In suspended material we measure POC (Particulate Organic Carbon), PN (Particulate Nitrogen) and algae pigments (chlorophyll a & b, Phaeo a & b). In sediment we measure the quantities of fine grained material and algae pigment (chlorophyll a & b, Phaeo a & b). The quality of the environment can also be monitored through the study of pollutants. In the lab we measure Polycyclic aromatic hydrocarbon (PAHs),Polychlorinated Biphenyls (PCBs), brominated flame retardants, organotins, organochlorine pesticides, mostly in water and sediment, but in organisms too. We are the only Belgian lab accredited (i.e. recognised for our strict operating standards) to identify oil pollution through “fingerprint analysis”. In these tests we compare the characteristics of an oil sample against those of a reference sample.